Packing can be a stressful and nightmare to figure out, especially if you plan to only bring a backpack with limited space for your necessities. To help with those considering this bag, I’ve decided to list down my packing list when I usually travel for more than a week. I’ve always been fascinated with packing lists and would love to read or watch others so for those who like to read about these information, so this is mine! 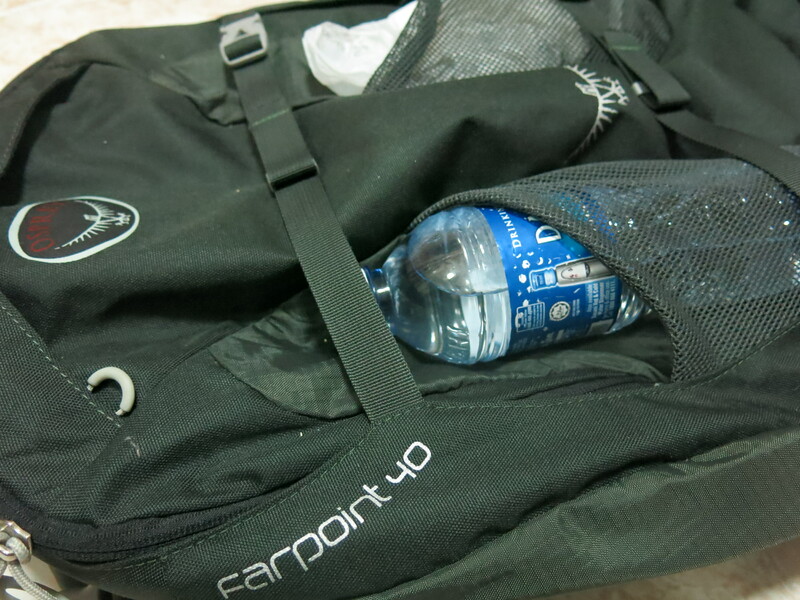 The Osprey Farpoint 40 backpack is pretty compact and have a limited luggage space so you will be forced to streamline your packing to the necessities only. It does have sufficient room if you pack carefully but I personally do not like to pack too much into my backpack because it would look too bulky on my short body. I would usually carry 2 packing cubes + 1 toiletries pouch. Arranged below around it is my travel towel, packable backpack, jacket (which I would usually carry layered on top of everything here instead of rolled up as shown here) and my electronics pouch. 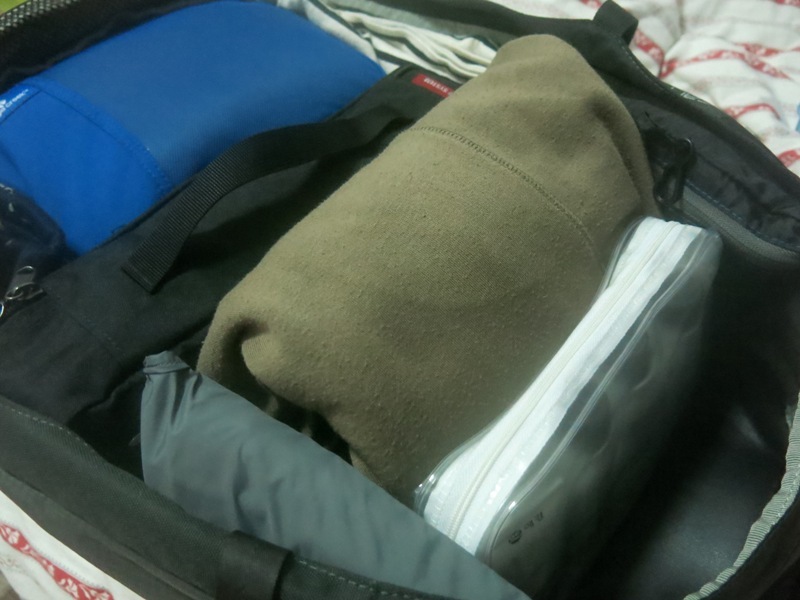 I could fit in a half cube and tube packing cube with space for my travel towel, toiletries bag, packable bag and jacket. I don’t generally like to wear pants or jeans so I would wear leggings instead, paired with a long shirt for the plane ride. All of the above can fit into one packing cube. I would usually layer the skirt and shorts on top of the rolled up tops and dresses shown here. There are 4 tops and 2 dresses here. I can also fit in 2 skirts on top of this or 2 tops. 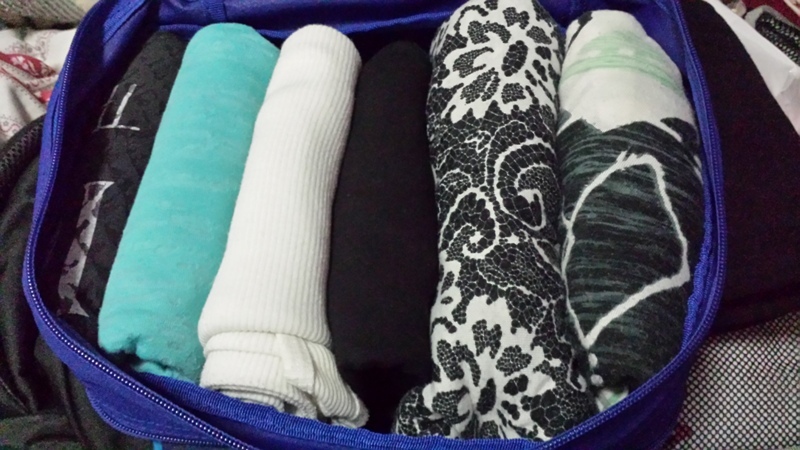 I would pack my undergarments here and any extra leggings, usually during winter. I like to bring a week’s worth of underwear and wash them everyday if need be. I would usually bring along a small bottle of shampoo, conditioner, body wash, cleanser and my dental kit here. If I’m travelling for more than a week, I would buy my supplies when I’m there but I also find that it’s more convenient for me to bring along a small supply to tide me over until I can get mine there. I’ve realised that it may not always be easy to hunt down my supplies, especially when I have limited time on my trips. There are still space available for more items, especially if the jacket is removed. I am also able to fit in my camera (Canon G15) into the bag. I keep my electronics such as travel adapter, phone charger and camera battery charger into another pouch which I can slot to the side of this space. There is a small pocket at the top of the bag which is quite deep. 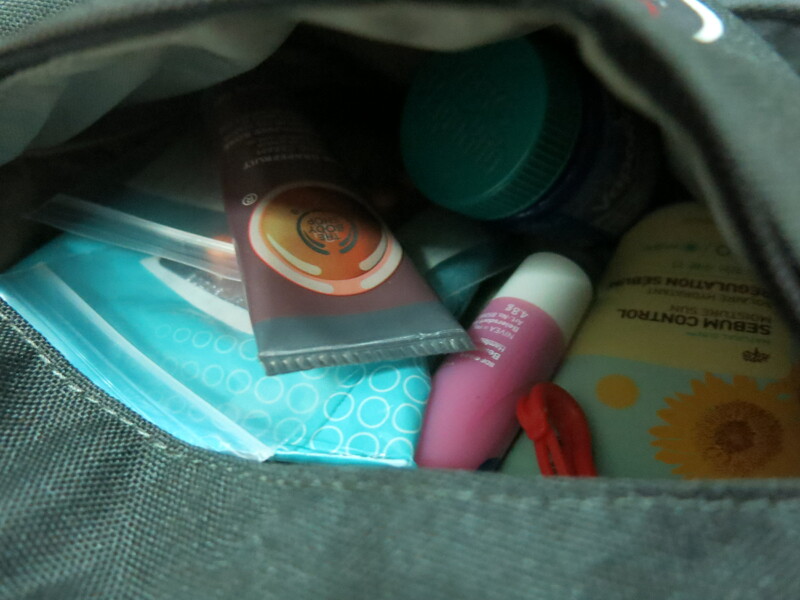 I would usually include my essentials such as sunblock, medicated ointment (Vicks) and a small pouch with medicine because it was quite convenient to get to without having to unlock all the other compartments. Small pocket that can hold quite a lot of small items. I have my hand cream, sunblock, lip balm, wet tissues, medicine and a bottle of medicated ointment “Vicks”. This pocket also has a small hook at the top. I would usually pack along slippers for the hostel room and ballet flats/ sandals into the 2 mesh pockets at the front of the bag. These mesh pockets are big enough to fit a 1.5L bottled water if you want to so I have no issues with slotting in these 2 footwear into each pocket here. There are straps at the sides to compact the whole backpack so I would just secure them by tightening the straps. Mesh pockets are perfect to slot in my footwear! And that’s it for my packing list! There are a few items that I bring along in my handbag but these are my usual packing for this bag. Of course, my packing may change if I am bringing another luggage that allows for more space but I sometimes have a bit of fun packing as little as possible as I do like it when I travel light. I also don’t make it a habit of leaving with a full backpack so that I have a little room for additional items should I pick up more on my trips. 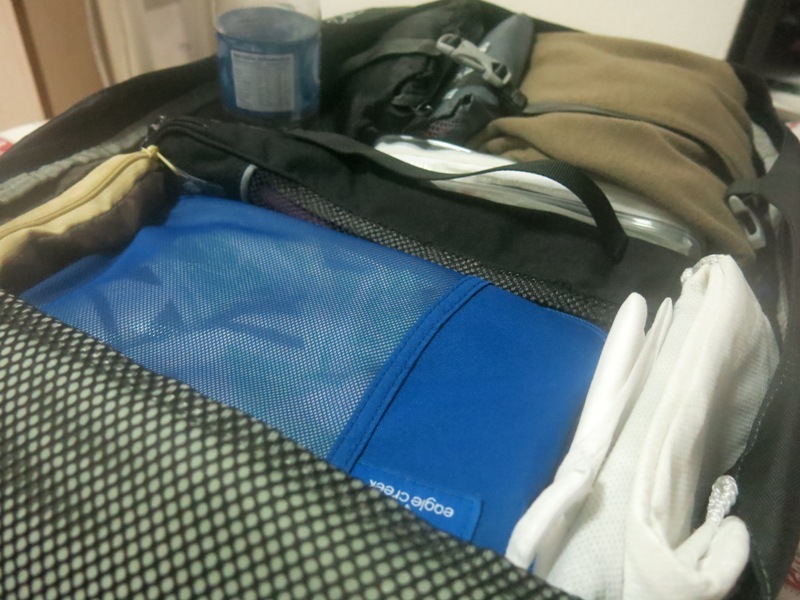 Packing cubes are great! I especially like that I can separate my dirty clothes from the clean ones when returning from a trip. When I get home, I just dump everything in the cubes to the hamper. Judging by the way you packed, you are certainly more organized than me 😀 I have never had a packing list..maybe I should now..
Wow! You have packing down to a science! 🙂 I traveled with a carry-on sized 48 litre Osprey during our year long RTW, and it was the best decision ever. I loved being so light on the road. Don’t think I could do it now though…my traveling style has definitely changed since then!! Your packing looks very similar to mine Sha. I really keep it to a minimum whenever possible. I go with the layering idea rather than brinign bulky coats to keep warm. I usually have a rain jacket that can act as a windbreaker. One sweater or fleece or sip up jacket under neath or on its own. I also find a light down jacket that can be put in a pouch is light and takes up very little room. Can you tell we travel to some colder destinations? You pack very neat and orderly. I bet it is easy to find everything as well. Those cubes look like they come in handy. I wish I could say that I am as organized as you when I pack, but I am not. It looks like you have it all sorted and know what you need! Hi Sha! Thanks for posting this up 🙂 It really helps to give a rouge gauge how much i can fit in the Farpoint 40. Haha and I would love to have your packing skills – to be able to carry so little and pack so neatly omg haha. It has been a pleasure reading your blog!